Everyone, meet Laura. Laura, meet the world. Just when we thought we received the last of our Scribblenauts Rooster Hats out of the limelight comes one more. 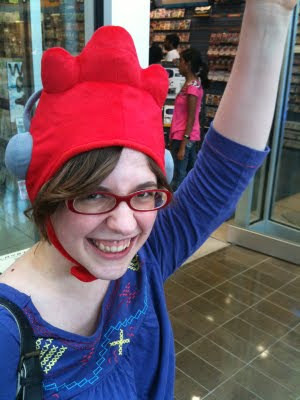 Laura, lest you have any doubts, this photograph proves definitively that you are made of epic win. For this, the entire team at NextGen Player salutes you. It's become abundantly clear to all of us here that these rooster hats are filled with contagious smile. Just look at how happy they make their wearers. 5th Cell may well have given out the best pre-order bonus of all time. Anyone else looking for 15 minutes of quasi video game fame? Send your rooster hat photo to us at comments@nextgenplayer.com. We'll post the best ones here on NextGen Player!